Even though the Ricardos made a solemn promise not to influence their son's future, Lucy buys the boy a doctor's kit and Ricky gets him a little snare drum. The five-year old opts for the shiny new drum from Schirmer's Music Store, and there begins a four-day nonstop concert consisting of a monotonous but rhythmic beat. The sound becomes so unbearable that Lucy and Ricky find themselves functioning to the unending beat. When Lucy squeezes oranges for Ricky's juice, she does it to the rhythm of Little Ricky's drumming. When she scrapes his toast, a similar situation prevails. Even the Mertzes, godparents of the little musician, are ready for strait jackets. The Mertzes decide to politely ask the Ricardos to have the child "limit" his playing. Ethel: "Just to give his little hands a rest." But the Mertzes' true feelings are exposed when the youngster pauses momentarily. Fred: "What a relief! I thought he'd never quit!" Ethel tries to soften Fred's statement: "He's just amazed at the child's stamina. He didn't think anybody could keep up that racket for four whole days!" Naturally, an argument ensues, and Fred threatens eviction, despite the Ricardos' ninety-nine year lease. To force their departure, Fred turns off the tenants' water, gas and electricity. As Lucy and Ricky are about to retaliate by subjecting their landlords to a rousing drum version of the "Nurtz to the Mertz Mambo," another verbal battle begins. Mrs. Trumbull halts World War III when she becomes concerned about Little Ricky, who has apparently disappeared. After a frantic search, they find him curled up on the Mertzes' sofa fast asleep, the noise was too much for him. Special Notes: This is Elizabeth Patterson's (Mrs. Trumbull) final appearance. 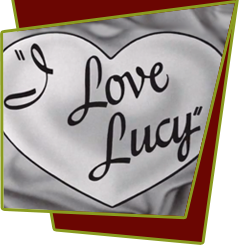 Bloopers: Lucy's false eyelashes are removed for the bathroom scene but magically reappear when she walks into the living room. When Ricky enters the Kitchen during the drum sequence, the nearby ice box next to the refrigerator opens on its own. Later in the scene, Lucy closes the ice box. In the next shot, the door is completely open. During the kitchen scene, Lucy misses tossing one of the squeezed oranges into the trash. It can be seen rolling on the floor.